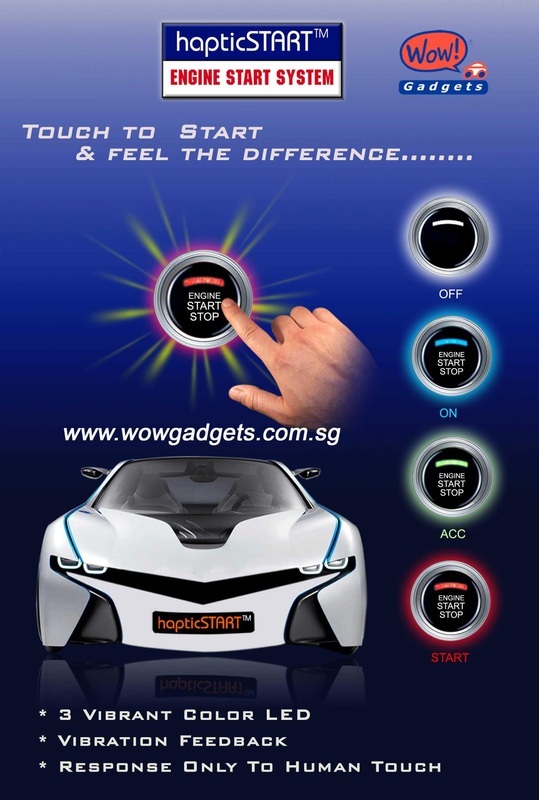 hapticSTART™ engine start system from Republic of Korea is integrating with the advanced technologies, does away with traditional key, allowing the ignition to be turned on & off merely by human touch sensing! You may have heard of Push Start Button, but this product will introduce the new way to start your car, just touch and Haptic (vibration) will be felt by your finger. It will only response to human body and no response to any other objects. The latest human sensing touch technology is applied to hapticSTART. It has 3 vibrant colors LED and background wording which will improve significantly the interior of your car. The status such as ACC, ON, START, Doors open/close, Alarm arm/disarm can be known easily by looking at the LED color and background wording. Keyless Push start maybe found in some luxury or concept cars, now you can upgrade your car with the same keyless start feature but with much more advance technology by human touch sensing. All parts used in this product had been certified for strict reliability testing under high/low temperatures, humidity and vibration. among others international automobile standard. 1) Where is this product from? hapticSTART is 100% made and assembled in Korea. 2) What do you meant by "haptic" feedback? Haptic is a technology that interfaces with the user through the sense of touch. As for hapticSTART, it will response only to human touch with vibration feedback. 3) Is the button reliable since it is a touch sensitive? Yes, the product has undergone strict quality control for reliability and safety which meets international standard. The surface of the button is hard, similar to the touch screen of iPhone. 4) Can the hapticSTART to be installed elsewhere or only on the ignition switch hole? In most cases, hapticSTART is most suitable and practical to be installed on top of the original ignition hole but it can also be located elsewhere. 5) Do you need to remove the original ignition switch? 6) Is it safe since I can start or stop the engine by touching on the button? To start the engine, first the car alarm needs to be disarmed and secondly you need to press the brake pedal at the same time. We could also incorporate keyless alarm system, which means that you can only start the car when the keyless card/ remote is inside the car. To stop the engine, you need to engage the hand brake or PARK lever. 7) My car has immobilizer system, can hapticSTART works? In most cases, the immobilizer needs to be bypassed or the immobilizer scanner to be relocated where you can place the remote control with immobilizer chip. Immbolizer interlock system differs from each car made or model, hence we need to evaluate the system before deciding on the solution.